If you have small animals that are housed outside, it is worth thinking about where they will live during winter. Rabbits are more adapted to the cold than many people give them credit for, however, they don't tolerate extreme cold very well and can fare badly in strong wind, driving rain and dropping temperatures. This is especially the case for newborn and young rabbits. 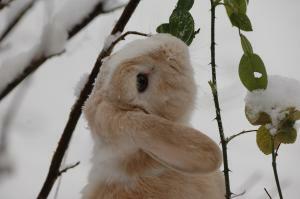 Wild rabbits live in warrens which, being confined underground, are well insulated from the cold. If the weather is poor, a rabbit will burrow deep inside the warren and stay put until conditions improve again. The temperature here stays relatively constant so there is no need to move elsewhere. Outdoor rabbits need the same protection from their man-made enclosures. If you intend to keep them in their hutches, it is essential these are winter-proofed to keep your animals warm, safe and comfortable. Some pet owners take the decision to bring their rabbits and guinea pigs inside as winter approaches. So long as they still have the space to move and exercise, the indoors provides an appropriate environment for small animals during the cold months to come. If, on the other hand, there just isn’t the space to accommodate rabbits in your home, think about how you are going to prepare their outdoor areas for winter. Also consider your small animals' daily ration of food and hay as they are likely to consume more of it as the weather changes. This is because they burn more calories to generate body heat. If their daily food ration isn't increased, minor weight loss might be evident. In the wild, rabbits and guinea pigs would stockpile food ahead of winter in case provisions were scarce and starvation threatened. Small animals have evolved this way so don't be alarmed if you see your rabbit burying food or getting through more of it than usual. Adjusting the diet in line with the season will keep your rabbit's body temperature up and maintain its weight and condition. If, however, you notice severe or rapid weight loss in your rabbit, have your veterinarian examine it as soon as possible. First things first when it comes to winter-proofing your rabbit hutch. Unless your enclosure is in good repair, it won't provide the protection needed for your rabbit to stay warm and dry. Draughts are one of the biggest nuisances to rabbits and guinea pigs as they get beneath the coat and chill the skin. They can also be very stressful to small animals who can't get out of a cold breeze or warm themselves against a draught. For this reason it is essential that you check your hutch for any cracks or gaps that would allow cold air to filter through. If your hutch is old, it might be worth insulating the inner walls anyway, just to be sure you aren't missing any damage. Most modern and traditional rabbit hutches have a wire mesh door that opens into a living space. This ensures the hutch is kept well ventilated and allows your small animals to see out. In the summer, the mesh feature is a plus, keeping your animals cool and permitting sunlight in. When the weather changes for winter, however, the mesh door exposes the hutch to the elements, allowing wind, rain and snow to enter your rabbit's home. To prevent this from happening, move your hutch to a sheltered spot and turn it away from the wind. Some people opt to drape plastic tarpaulin over their hutches and runs to protect against winter weather. Available from VioVet is the Harrison's Animal Run Rain Cover. If you can, move the hutch inside a shed during the worst of the weather. Garages are not safe places for rabbits and guinea pigs as car fumes can cause poisoning and asphyxiation. Perspex is commonly used across the mesh doors of hutches to keep out the cold but still allow daylight through. This can be purchased cheaply and fixed across the door without too much difficulty. To insulate the hutch, try using carpet or cardboard. Some rabbit owners line the floor of their hutches with cardboard before covering in wood shavings and then another sheet of cardboard. By sandwiching the shavings between cardboard, you have a padded and insulating floor which can then be covered in straw to keep your small animals cosy and supported. Make sure your hutch is off the ground to prevent moisture seeping through the wood and chilling your rabbit. If the hutch isn't on legs, use a brick under every corner to raise it off the floor. This will mean your rabbit is kept warmer, too. Bedding is another important factor when thinking about winter-proofing your pet's enclosure. Rabbits and guinea pigs love to feel enclosed and protected. They also enjoy the warmth and comfort of bedding that is dense and regularly replaced once dirtied. Often hutches have a smaller sleeping compartment divided off that rabbits can retreat to. The door to this is usually always blocked off with a solid piece of wood, unlike the mesh door to the living space. This is where the bulk of the bedding should go as most rabbits will choose to sleep here. Good bedding should typically consist of newspaper, wood shavings and straw. The newspaper will insulate the flooring and absorb minor moisture from weather and litter. Wood shavings provide another layer of protection and warmth, while straw offers the bulk of the comfort. Hay should be offered separately in a hay rack kept off of the floor. The process of chewing hay keeps the teeth of rabbits and guinea pigs healthy and maintained. The Snugglesafe Heat Pad is an innovative product that provides up to 10 hours of lasting warmth for small animals that are housed outside. The heat pad is microwaveable and designed with your pet's comfort and safety in mind. For this reason it is non-toxic, chew resistant and hygienic. It doesn't expand when heated or pose a burning hazard to your animals. Simply place the heat pad in its fleece cover and beneath a couple of sheets of newspaper or straw - wherever your rabbit most likes to relax or snooze. When the pad has cooled down, simply re-heat it and place back in the hutch. Unlike hot water bottles and granary bag alternatives, the Snugglesafe heat pad cannot be chewed through and its contents spilled. If you are looking for something a little bit more luxurious for your small animals this winter, why not give this product a try. Particularly great for young and convalescing animals.